“I’d love the children who come to Pencott to leave with an impact in their heart as well as their mind”. Philip, Director at Pencott Valley School, told us this on the first day of our most recent trip in February. He isn’t a push over by any means, but you can tell by the way the children interact with him that he cares for them. Pencott is looking very smart, with some new gates for added security and their new veranda. We helped to begin the building of the veranda in November 2015, since then it has been used daily by the children to shelter from the sun and rain, to sit together to eat their meals, for assemblies and other whole school activities. Philip introduced us to two children who are now in secondary education, whose lives have been transformed by the education they received at Pencott. One of these boys, came from an incredibly poor family who were struggling to provide food for him and his brothers and sisters let alone send them to school. Philip invited them to join the school. Julian was at the school for 5 years and made the most of it, getting distinction in his final exams. He was offered a scholarship enabling him to attend secondary school and again excelled. He is in his final year of secondary school and wants to be a doctor. This is something that is very much within his grasp. Julian told us how grateful he was to the school for giving him this opportunity to make something of his life and eventually to be able to help his family. When I asked him what he remembered about his time at Pencott he responded instantly, “I remember that they cared for me. They didn’t just teach me, they cared about me too”. We spent a wonderful week with the children currently attending Pencott. We played sports with them including a very boisterous game of football, and a much more subdued game of rounders! The loom bands were a huge hit, and the children loved their letter-writing lesson, replying to letters from children in the UK. 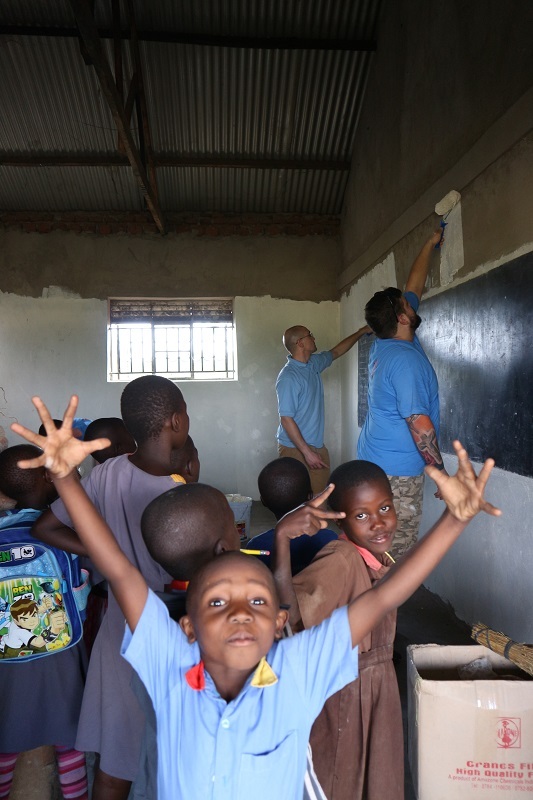 Our team also managed to paint the two freshly plastered classrooms, giving the whole place a much brighter feel. As these children head into their new school year we look again at the best way of supporting the orphans who are attending the school. The money provided by Operation Orphan each month goes towards the teacher’s salaries and the much-needed meals for the children. If you would like to help us support these children please click the link below.